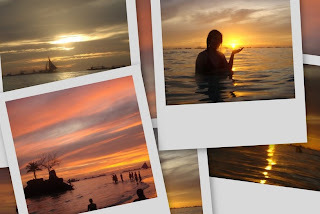 No electricity, no night life, no fancy resort but simply a long stretch of fine white sands and sand bars and clear seawater, this was Boracay twenty years ago. I've heard so much how Bora has turned into a commercialized touristy area since, seemingly nice and sad reality. I arrived in Bora greeted by no less than it's lovely sunset, i could not help but lift my flipflops and stroll on it's fine white sands barefoot. Yes, 20 years later, I am happy to see the sand remained white and fine, thank God! (Beachcomber @ Station 1 by night) Chilling-out by the seaside, al fresco dining, drinking and dancing the night away... I think I had the most alcohol intake, my entire life combined in those three nights. Exag? Maybe not! I had my first taste of beer (surprisingly, it doesn't taste as bad as it smelled), managed to stay sober with frequent pee break, I easily finished a bottle... a bottle of water! haha Alcohol and me just isn't the perfect match. (Beachcomber @ Station 1 by day) It is amazing to see the tides go low at night, making way for a larger space for the crowd to hang around by the shore. In the morning, the tides are high, perfect for a fun day under the sun. I wonder if the tides ever go low in the morning and high at night? In that case, there would be no seaside party! Tip # 2. Rent a cabana at Waling-Waling and take an afternoon nap on one of the hammocks. Wake up to the view of the sunset and wonder where all those hours went. Tip #4. At Nami, try the massage at their spa. You’ve never known kneading that good. - We tried calling (036)2886753 to 54, the cheapest massage service is @ P900, was it a good thing that no masseurs was available? hehe So three of them opted for a massage at Waling-waling, I opted not to have one since I felt undeserving after doing nothing! haha Beach bumming it is! I finally found the right term, that is exactly what we did for 3 days and 3 nights. Bora is also enjoyed for its great food, so watch your diet, you may arrive with flat abs and leave with bulging belly! The ribs @ Hawaiian BBQ, the pizza and pasta @ aria (italian for air), egg omelet @ lemone cafe, chicken @ Island chicken Inasal, fruits in ice cream... are superb but pricey! Now, my mom tells me we should have gone to D Talipapa and buy-your-ingredients-and-we'll-cook-them-for-you system @ Plato D'Boracay. I do not know anyone who's more frequent in Bora than my parents, they go there once, twice or thrice a year so maybe I should heed her tip next time. a ride on the flying fish (no one wanted to go on this, sniff!) and maybe try out kite boarding then have a well-deserved massage at Nami's Private Villa.